I know all of you are familiar with scrambled eggs, but I'm not sure how many of you are familiar with scrambled cottage cheese. An Indian favourite with rotis and very easy to prepare. 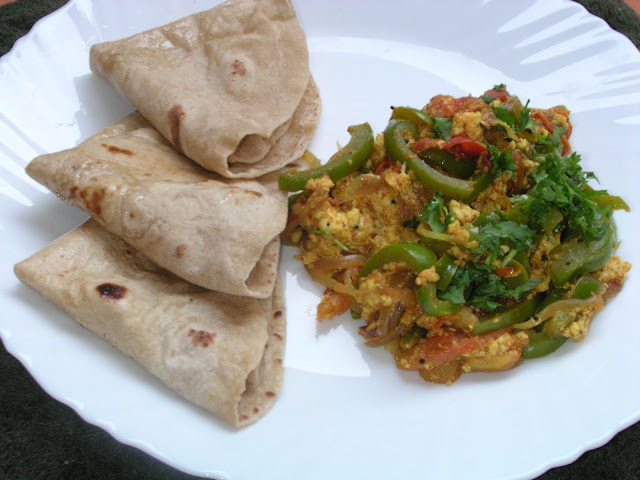 If you dont make rotis you can serve it with wholemeal bread and you wont be disappointed. If you like it spicy you can add a chopped green chilli as well. Tip- Dont overcook the cottage cheese. If overcooked it turns chewy and loses its soft texture. So for best results in a paneer preparation always add it last and take it off the heat once you have stirred well. If you'd like to try a hand at homemade Paneer, click here. Heat oil in a pan, and crackle the mustard seeds. Add sliced onions and saute. Then add the sliced green pepper/capsicum, stir, cover and cook. When half cooked add the tomatoes, cover and cook. Add the tumeric, chilli garam masala powders and salt. Stir well. Add crumbled cottage cheese/paneer and stir well. Take off the heat. Garnish with freshly chopped coriander. 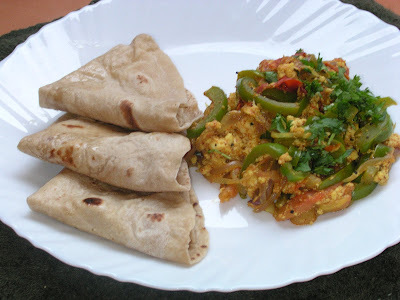 Serve hot with hot rotis. I've never tried a scrambled cottage cheese but what an excellent idea, I will try very soon. This is awesome, scrambled cheese! Looks so perfect, Shirley! (I mean the the cheese)haha... Btw, I've left something for you. Please feel free to drop by my blog to collect it. Have a nice day! I have never heard of this before but already know I would love it! I adore paneer cheese. Looks fantastic. I followed your link to learn how to make paneer. It looks a lot simplier than I thought it would be. Also, a lot less time consuming. Definitely something to put on my "food bucket" list. this looks great Shirley! very delicious, I've just eaten and it's making me hungry again. Until now I haven't made the paneer but it's on my list to make. It would be great to try some new flavors for scrambled cheese. I like the roti, especially the slightly brown parts! Scrambled cheese - how delicious! Very rich in flavor. A great addition to the Showdown! Thanks for sending it over! Watermelon-Mint Crush- Beat the Heat!